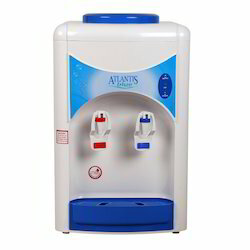 Leading Manufacturer of atlantis blue hot and cold floor standing water dispenser, atlantis blue normal and cold floor standing water dispenser, atlantis blue hot and cold table top water dispenser and atlantis blue normal and cold table top water dispenser from Noida. 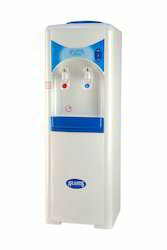 Get clean and pure water whenever you want, at whatever temperature you want. Apart from being hygienic, these dispensers are very easy to maintain. So whether it's a steaming hot cup of tea or a refreshing cool glass of lemonade or just a glass of plain water, Bottled Water Dispensers are perfect for all. 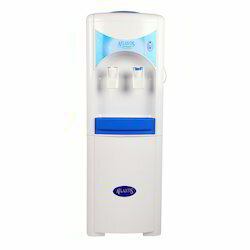 Made available by us is a commendable range of Normal & Cold water dispensers. The products we offer are developed by a team of skilled professionals, following industry laid norms. Owing to low maintenance cost and reliability, our offered products are considered ideal to be used in homes, offices and institute as a free refrigerant. Backed by the profound experience of the market, we have been able to come up with a gamut of Hot & Cold water dispensers. These 4 liters cooling tanks are developed using ABS body and stainless steel tank as per international norms and guidelines. All our fast cooling tanks are considered suitable to be used for homes, institutions & offices as CFC free refrigerant. The durability, excellent performance, and reliability of these products have increased their demand, across the nation. 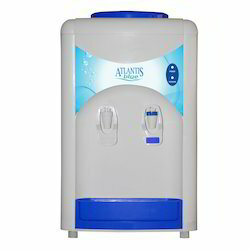 Provide clean drinking water all day long at your preferred temperature with the Atlantis Blue Normal and Cold Table Top Water Dispenser. This dispenser features durable and sanitary stainless steel parts. Convenient push-button control makes it simple to use.